Braces can change your life for the better. But the success of your treatment depends on how well you take care of your teeth. That goes for brushing your teeth regularly, flossing between each and every tooth, and visiting your dentist. Many people may not realize that what you eat and drink affects your oral health. 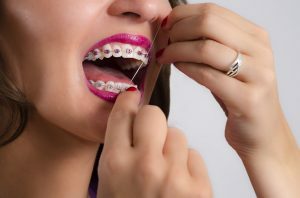 Your orthodontist in South Hills of Pittsburgh is here to help you understand what to avoid to optimize your straightening treatment. It’s important to recognize that an excessive consumption of any type of sweetener will have an impact on your overall health. For your oral health, one of the worst things you can do for your mouth is consuming lots of sugar, multiple times a day. Here’s why you may want to rethink your overall sugar intake. Tooth decay occurs when sugar mixes with leftover dental debris in the mouth. Bacteria and sugar mixes and creates toxic acid in your mouth. This acid will wear the enamel of your teeth. This only gets worse when you drink sugary, acidic substances. Believe it or not, even “diet” or “sugar-free” drinks still contain acid that will harm your teeth over time. If you’re constantly attacking your smile with sugary, acidic drinks, you will weaken your tooth enamel and be susceptible to dental problems. It’s easy to avoid cavities and tooth decay if you avoid soda, energy drinks, or sports drinks. If you’re really trying to make the best decisions for your health, drink lots of water! Water can be infused with fluoride which helps strengthen your tooth enamel and keep you hydrated. Your dentist can also supplement your dental treatment plans with fluoride treatments. Next time you’re contemplating whether or not to drink that soft drink, think about how much sugar is in each drink. Your dentist wants your smile to be fantastic when your braces are removed. That just takes a little effort on your part. Remember, brush regularly, floss, eat and drink with your health in mind, and finally keep your regular dental appointments. Do you need an orthodontist that cares about your overall health just as much as your oral health? Your South Hills of Pittsburgh orthodontist, Dr. Gary Cartwright, has been practicing orthodontics for over 20 years in his local community. As a member of the American Association of Orthodontists, he has a duty to make sure his patients get the most out of their straightening treatment. If you would like to speak to Dr. Cartwright, feel free to call our office!